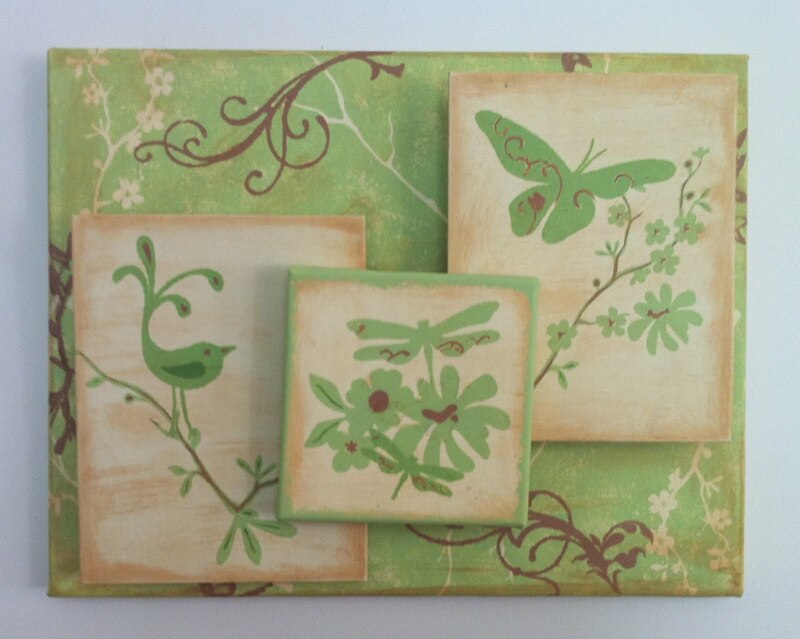 Utah's Crafty Chick: Canvas Wall Art - "Cricut Wednesday"
September 1, 2010 ~ "CRICUT WEDNESDAY"
Cricut Machine, "Home Decor" Cartridge, mats, etc. Base coat all canvas using the ivory acrylic paint; let dry completely. Cut out desired designs, on vinyl, using the Cricut machine and cartridge. You want to save BOTH the positive AND negative images from the vinyl. To do this, simply take your vinyl off of the mat and smooth a piece of transfer tape over the entire vinyl image. Now, slowly begin to peel back the transfer tape...make sure that your POSITIVES are the only images that are being removed on the paper and your NEGATIVES are remaining down in place. You will want to do this process with multiple images, filigrees, etc. and have them ready as you proceed with the project. Mix some green paing with a bit of ivory. We want to start out using lighter variations and ending with the darkest. Next take your images, that are on your transfer tape and place them down on your larges canvas around the outer edges. Smooth out and remove the transfer tape. Use your sponge brush & lightened green paint to paint over the entire canvas area. Let dry and remove vinyl pieces. Do step 4 over again with multiple images, if desired, using a lightened brown. Repeat steps 4 for the remaining 3 canvas pieces, but do not lighten the paint. Make sure to use the NEGATIVES instead of the positives. When all the canvas pieces are painted and dry, securely layer them using E6000. Let dry. Spray a clear acrylic, matte or gloss, to seal your project.